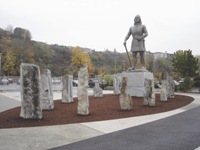 Undaunted by the rain, Seattle's Scandinavian-American community gathered to celebrate the unveiling. On a rainy Oct. 7, 2007, the Leif Erikson International Foundation (LEIF) unveiled a tribute to immigrants in a new setting for the statue of Leif Erikson at Ballard’s Shilshole Marina. Whether or not you had the pleasure of attending, we hope the following documents will help give you an idea of the day's events and their meaning for so many in our Scandinavian community. Eric Nelson of Seattle's Nordic Heritage Museum joined LEIF President Kristine Leander for the statue's ribbon cutting. Joining the festivities in honor of Scandinavian Heritage Day was Eric Nelson, who was introduced as the newly appointed executive director of Seattle's Nordic Heritage Museum. Nelson spoke and participated in the ribbon-cutting. (For every immigrant's name added to the memorial's rune stones, LEIF donated $10 to the building fund for the museum's new location on Market Street in Ballard. What’s the history of the Leif Erikson statue? 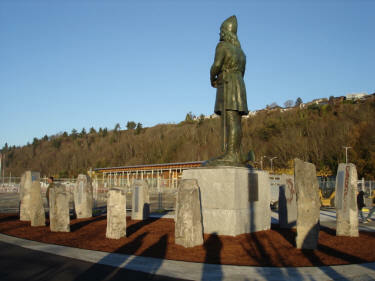 The Leif Erikson statue was a gift to Seattle from the Norwegian American community and originally unveiled during the Seattle World’s Fair in June 1962. The Leif Erikson League, whose members are now gone, formed an umbrella organization of local Scandinavian-American groups and raised the funds. 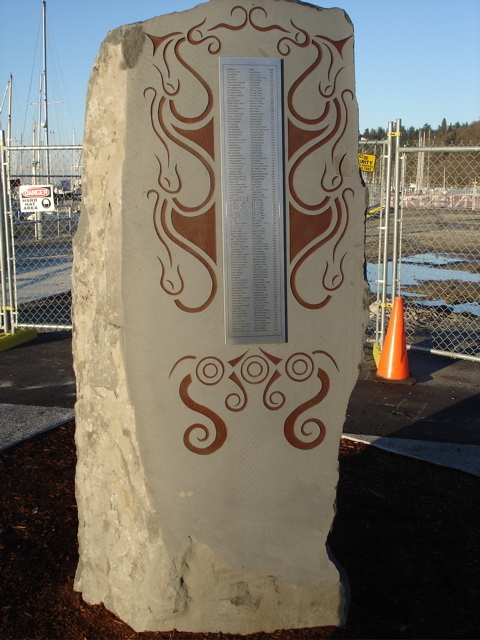 They gave it to the Port of Seattle, which located it at Shilshole Marina and has maintained it since then. When plans were made to renovate Shilshole Marina, the Port reported that the public was very interested in the future of the statue and wanted it to remain at Shilshole. What does the tribute consist of? 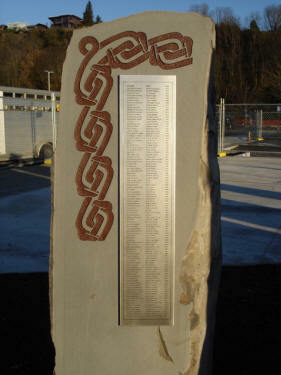 LEIF commissioned a new base for the existing statue and a display of some 850 immigrants’ names. (More names were added in July 2010 and October 2014, for a total of 2,351.) The statue base is a large granite stone approximately six feet high, in the middle of a plaza. 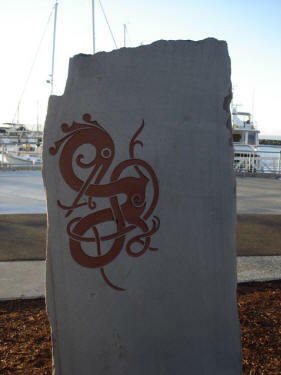 It is encircled with upright, runic-like stones, featuring authentic Viking carvings and plaques with the names of immigrants, along with their home towns and years of immigration. The base and tribute display were designed by internationally known artist Jay Haavik, grandson of the former pastor of Ballard First Lutheran Church, the Rev. O. L. Haavik. Jay won a Norwegian Marshall Fund award to study Viking art at the Viking Ship Museum in Oslo, Norway. Integrated with the renovation project, this new setting for the statue is a compelling tourist attraction. Who is the Leif Erikson International Foundation? We are a nonprofit, 501(c)(3) organization. 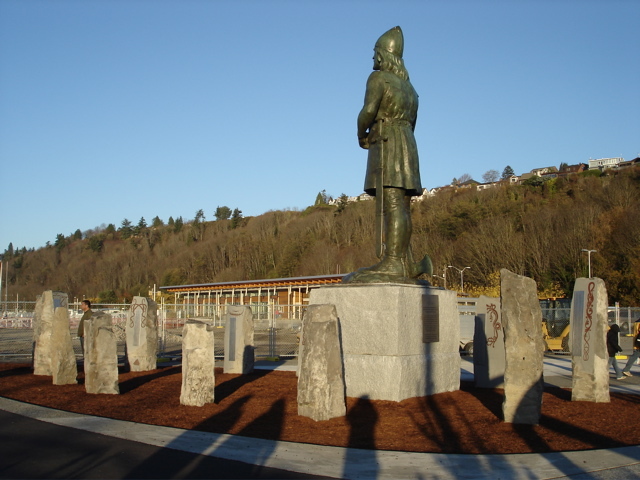 Our parent group, the Leif Erikson Society, was formed to give a replica of Seattle’s statue of Leif Erikson to Trondheim, Norway, in 1997 to commemorate the city’s 1,000-year anniversary. After that, many of the same individuals came together to create the Leif Erikson International Foundation (LEIF). In 2000, LEIF helped fund a replica of the same statue for the farmstead of Erik the Red and his son, Leif Erikson, in Brattahlid, Greenland, to celebrate the millennial anniversary of Leif Erikson’s voyage to America. Members of our group participated in the unveiling and our president, Kristine Leander, gave an address to the invited guests, which included the Danish Queen Margrethe and her retinue, the President of Iceland, and the Prime Minister of Greenland, plus other dignitaries. In 2000, LEIF also hosted an international conference on Vikings. LEIF’s mission is to: 1) promote Leif Erikson as the first recorded European to come to America; 2) promote Scandinavian culture; and 3) build bridges between Scandinavians and Americans. As a group, Scandinavians (Danes, Finns, Icelanders, Norwegians, and Swedes) are one of the largest—if not the largest—immigrant groups in Ballard. While Leif Erikson, the first recorded European to set foot on American shores, represents all immigrants who travel to new lands for freedom, opportunity and a future of hope, the tribute is for the Scandinavian-American community. For information about the project, read our FAQ. You can also or call LEIF president Kristine Leander at 206-778-1081. 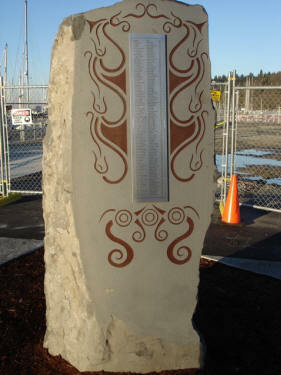 Read about LEIF's immigration tribute project in the Ballard News-Tribune and at Crosscut. Read more about the installation ceremony at the My Ballard blog. Enjoy this reminiscence from one Norwegian-American mom who found four of her daughter's ancestors on the rune stones. Or read this letter about one man's tribute to his grandmother.